The woman who had “no regerts” tattooed on her arm was forced to confess that she now had one, while the man with “Jenius” inked on his forehead soon had others begging to differ. At a time when body art has never been so popular, cases of carelessness among customers are all too common, said Veritas Language Solutions, an international translation and language service provider based in Britain, which recently claimed that poorly translated foreign words or phrases were a particular problem. 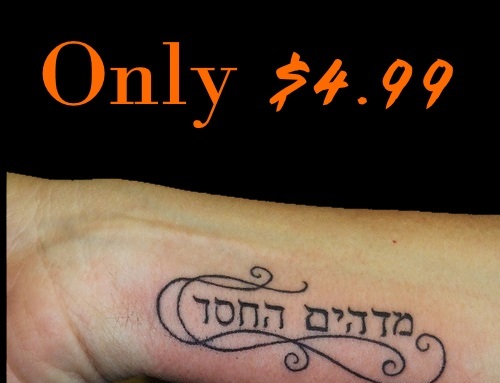 A woman who used an Internet translation tool to render “I love David” into Hebrew later discovered she had inadvertently had the phrase “Babylon is the world’s leading dictionary and translation software,” inked on to her back. In another example, a woman wanted the name of her favourite flower tattooed, but was left with the words “Sweet Pee” above her waistline. Sharon Stephens, the managing director of the translation service, said: “Tattoo translations are in demand and we regularly get requests for Chinese, Arabic and Hebrew and, now and again, Gaelic. Problems often arise when literal translations are used instead of finding out what the equivalent word or phrase in the foreign language is. Lively discourse is the lifeblood of any healthy democracy and The Star encourages readers to engage in robust debates about our stories. But, please, avoid personal attacks and keep your comments respectful and relevant. If you encounter abusive comments, click the "X" in the upper right corner of the comment box to report spam or abuse. The Star is Using Facebook Comments. Visit our FAQ page for more information.